We have a good mix of old and new events planned for 2018, please come back and check for updates. 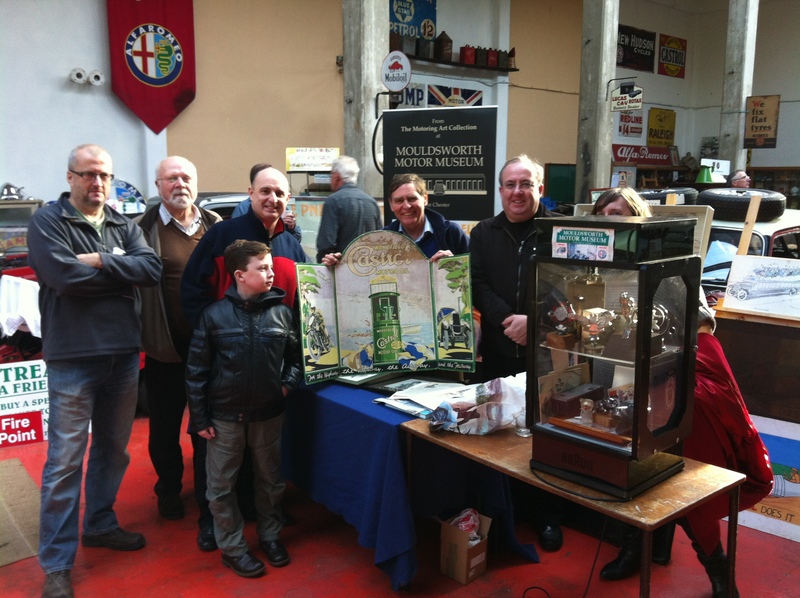 Sunday 22nd April – Drive It Day Peak District Run to Chrich Tramway Museum. 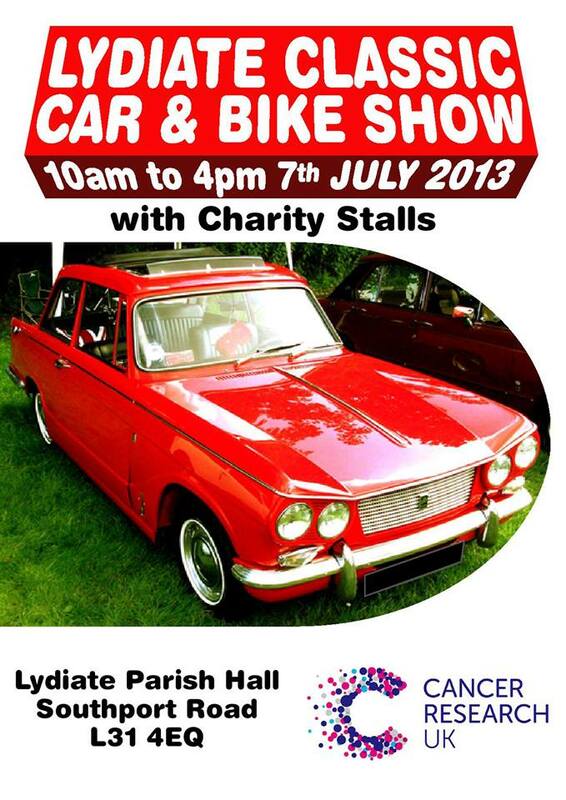 Sunday 1st July – Lydiate Classic Car and Bike Show – 8am start, £2 entry. Arrive early to avoid being turned away from this popular show! We’ll be meeting up beforehand to ensure entry together, details to come. 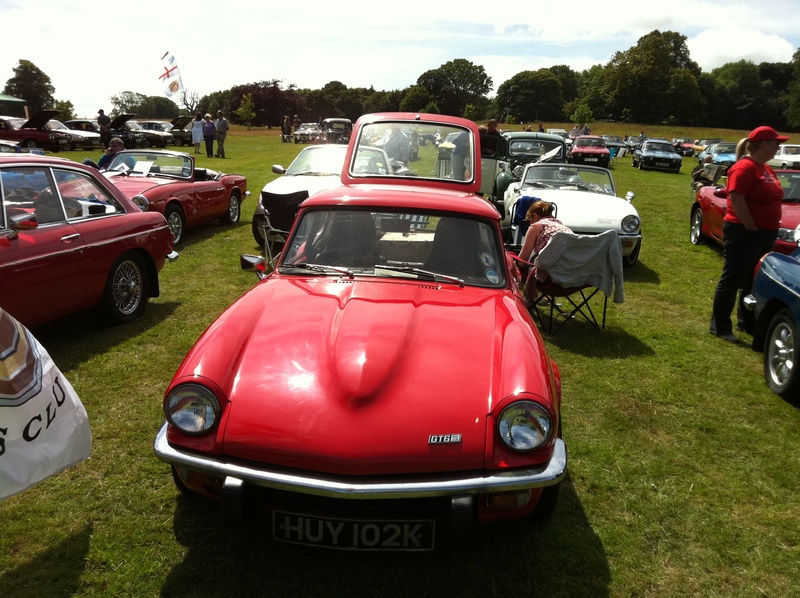 Saturday 4th August – Red Rose TR Fest, Summer Fayre, Antrobus Village Hall, Cheshire. A fabulous event, by kind invitation we’ll be at the Red Rose TR group’s annual ‘big bash’. 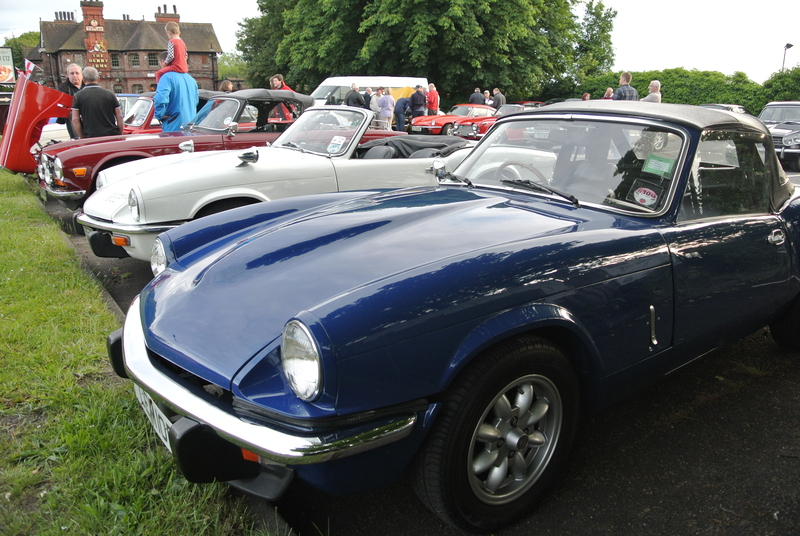 Further to our meeting on Tuesday, I have spoken with the TR Group about joining them for this year’s Drive It Day and many other drives scheduled for this year. They have welcomed us all with open arms and would like to receive confirmed numbers for the Drive It Day on 23rd April. Please could you let me know by this friday 14th April so they can update their group insurances and ensure they have enough route prints available for on the day. The group have extended the invitation to join them for a meal to wind down from the days drive. Details will be provided as soon as they are available. Here are events we are attending this year. To attend events not listed as individual entries, please contact Alex via email – triumphliverpool@gmail.com. Our 2016 Drive It Day Run was great success. Taking a circuit around Liverpool, from the City Centre to the site of the former Triumph factory in Speke, to Anthony Gormley’s Another Place at Crosby Beach, before finally heading to the Pier Head, we had a fab time! First up, we have a list of proposed Events for 2015. Events in bold we will definitely be attending. 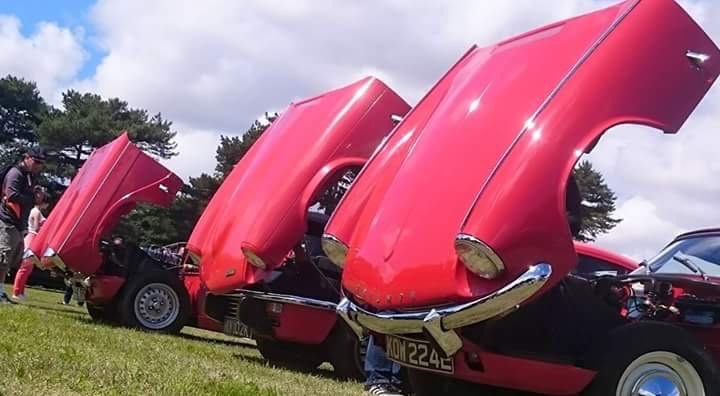 The Red Squadron was out in force again – bolstered by the enthusiastic attendance of Richard, who was taking a break from welding his Spitfire. An enjoyable day, despite the best efforts of Sid Snot and his cohorts – off-key Blues/Rock at 10.30 on a Sunday morning at a National Trust property? 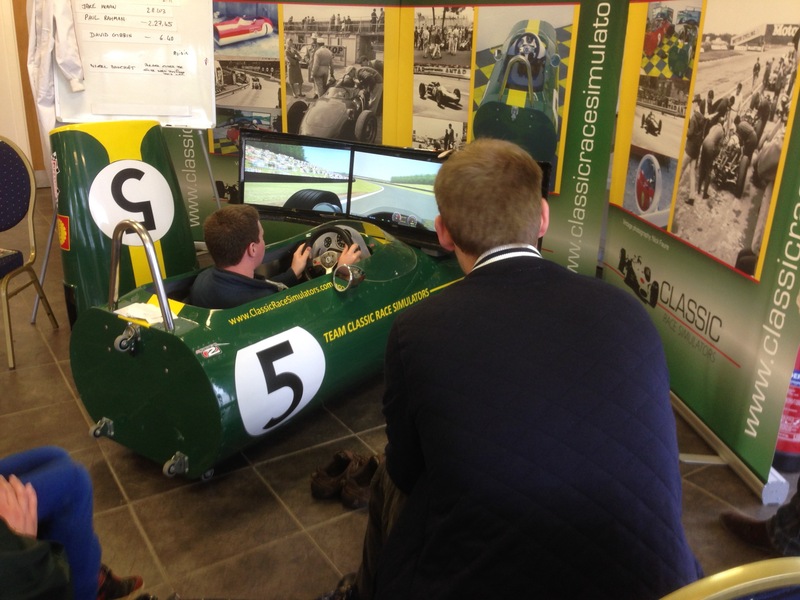 Richard giving it loads on the simulator. 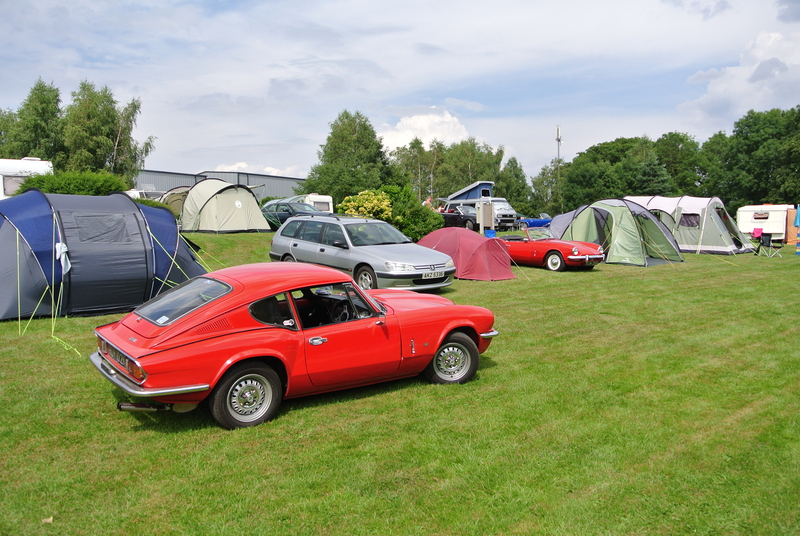 Dave, Richard, Stuart, Lee and Alex made the trip down to Donington for the TSSC’s annual bash. 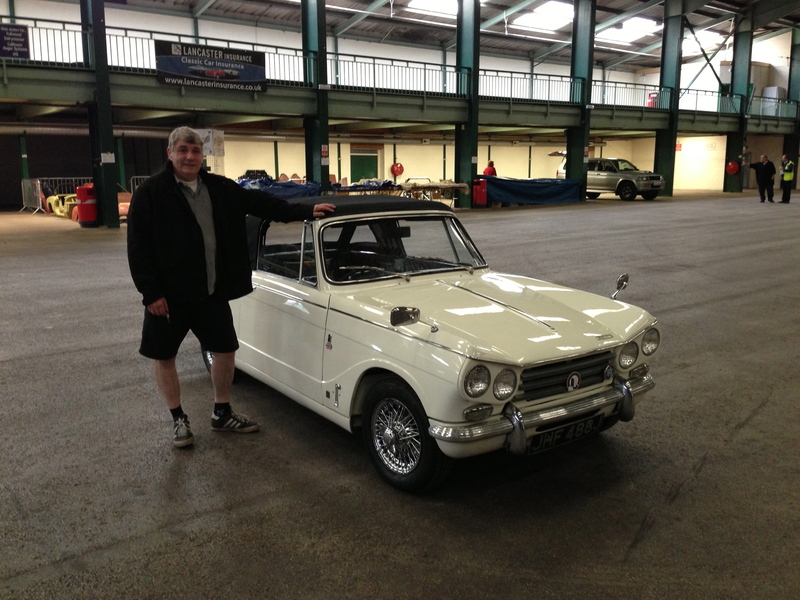 A mixture of parts collection, socialising and insurance valuations made for an enjoyable visit. A fantastic morning in the sunshine was (let’s face it) the highlight of the day, as torrential rain dampened everyone’s enthusiasm and rendered the afternoon cavalcade through Liverpool city centre a wash-out. There was time for plenty of photo opportunities though! Over at Lydiate the rain also drove people in the direction of home, but not before much fun had been had by all. Roll on next year’s show! It was back to Woodvale to “defend” our “Best Club Stand”, this time however we made way for the Vauxhall Owner’s Club who made of with the trophy, but no prize money this year. Holding the event on Father’s Day wasn’t the best idea, numbers were well done, probably scuppering the prize money? Anyhow, we enjoyed ourselves, managing to get the best of the high winds to erect our gazebo, and unfurl our new banner! Hurrah!! 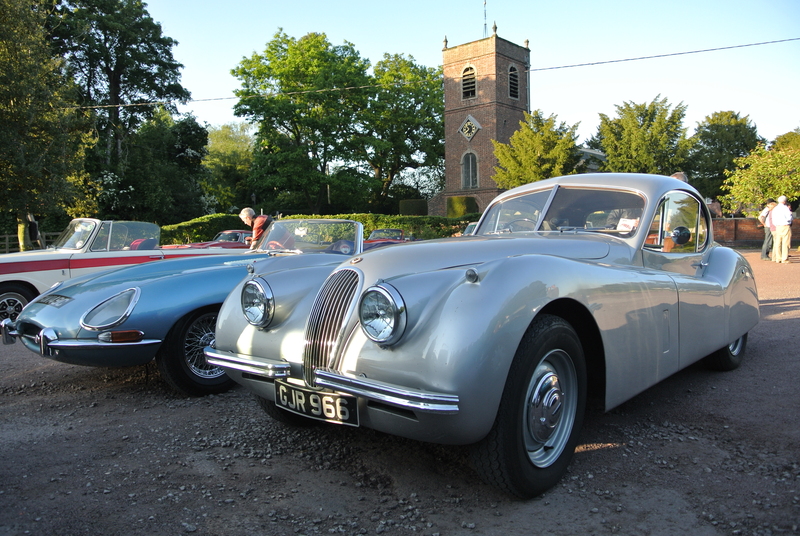 Inter-Area Meet at the Wheatsheaf, Raby. We joined up with TSSC members from Wirral, North Wales and Cheshire for the annual TSSC North West InterArea Meet, held this year at the Wheatsheaf in Raby. The weather wasn’t the best, but full marks to the chaps from North Wales who battled through some apparently torrential rain. Next year, we make the trip to North Wales. 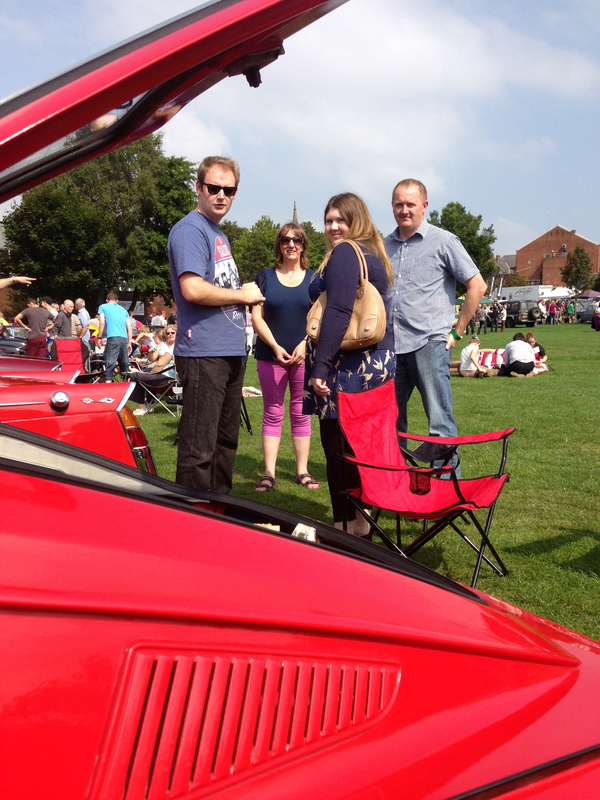 Our enthusiasm for the otherwise excellent Ormskirk Motorfest has been tempered by the somewhat shambolic organisation, which saw us shunted into the newly created “Club Stand” area away from the event. Despite protestations and assurances to the contrary, we found ourselves as one of only 2 Clubs exhibiting in the new area, with many other Clubs based in Coronation Park. Humbug! 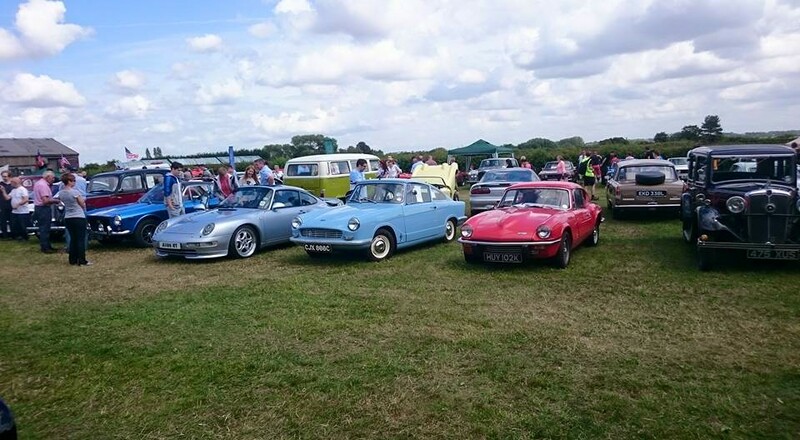 Bolstered by the continuing fantastic weather, Triumphliverpool had a small but enthusiastic presence at the TSSC’s first showing at Donington. Bereft of Concourse polishing duties, Alex followed Lee’s lead by completing (even slower) laps of the Heritage loop circuit. ‘Nuff said. All set up at Speke Hall. Another fabulous day in the sunshine (whisper it quietly but this summer has been pretty fab so far?). 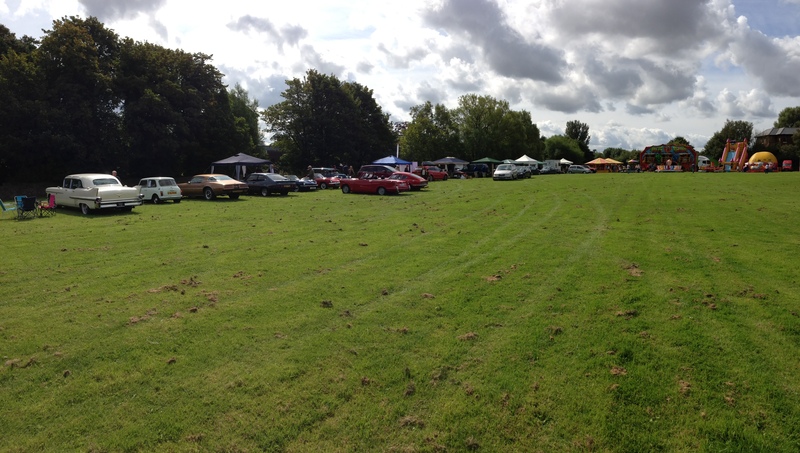 Lydiate Classic Car and Bike Show. The weather held out to give us plenty of sunshine, ensuring another fine Lydiate Show. Willaston Brain Tumour Charity Fete. 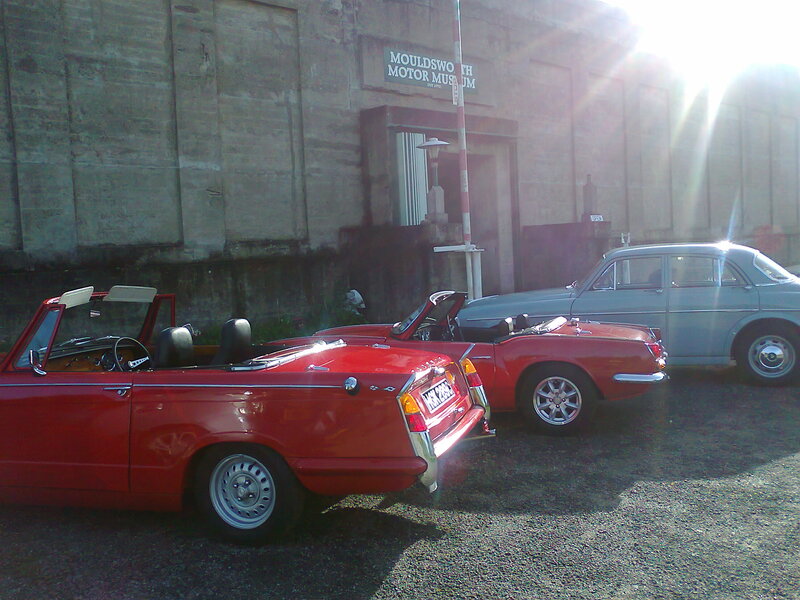 A Triumph and many Moriss’s. A small event, but a lovely one nonetheless. 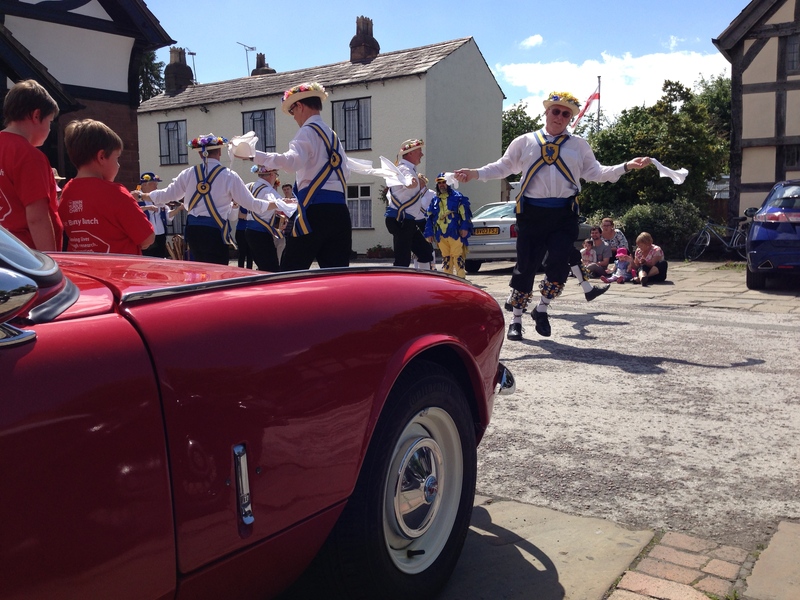 Great food, drink, weather, company, Morris Dancing, and a great drive to boot! 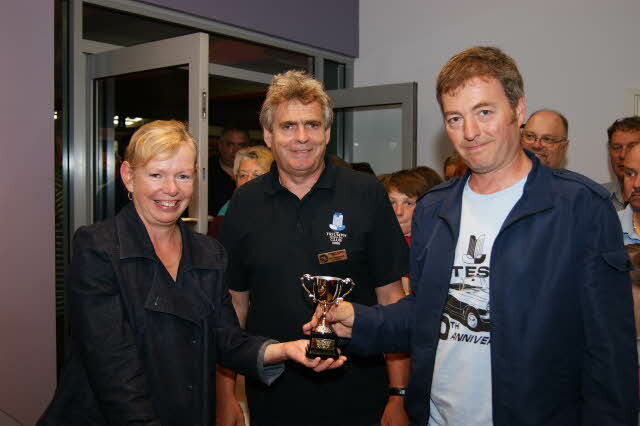 Woodvale Show – Best Club Stand Winners! Well, we don’t know how we did it, but we were awarded the Best Club Stand at Woodvale! 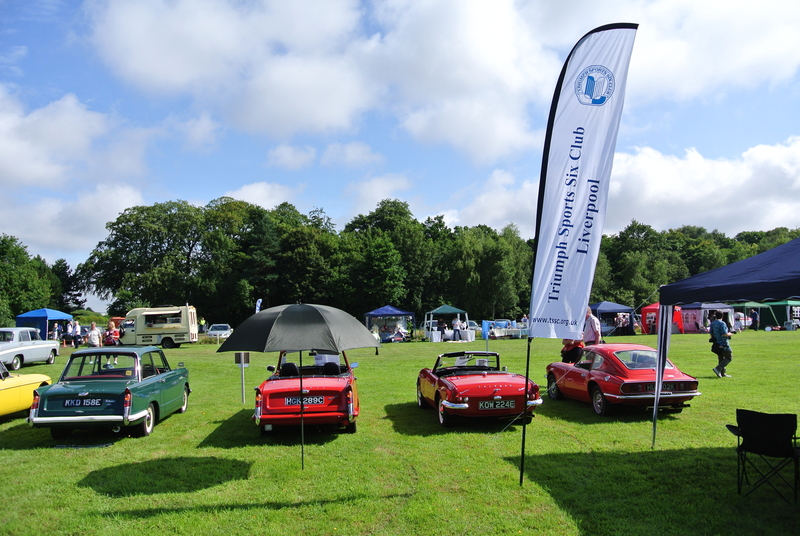 Seeing as the “stand” consisted of a Club Triumph banner, our cars, and erm…… us, it’s quite remarkable. Suppose people liked the cars, I did notice we were talking to punters a lot more than other Clubs, so the interest was there. 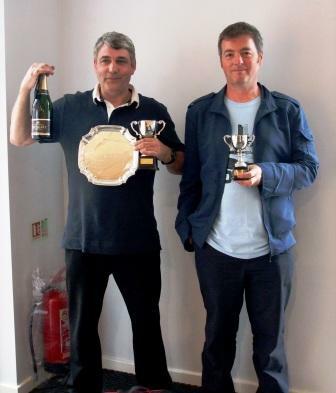 Oh, there’s also the small matter of a £250 prize for Area funds – Result! Saturday 7th June 2014 – Hale Carnival. 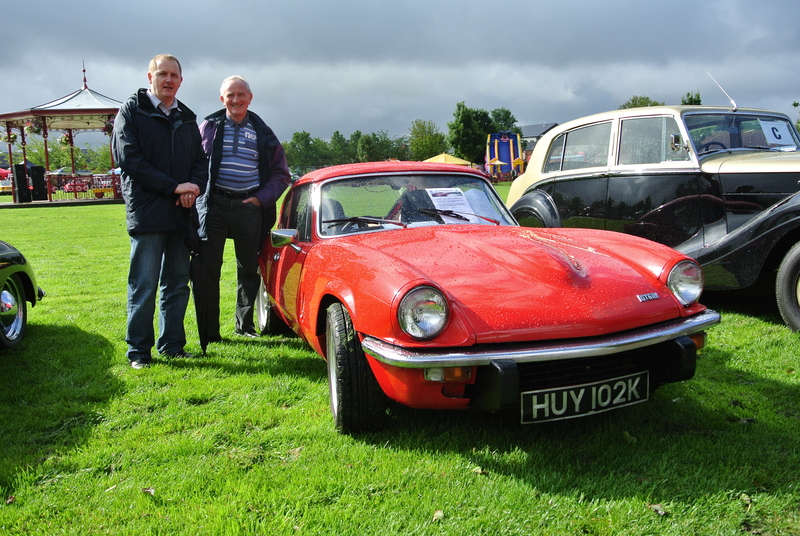 A little depleted in numbers, Lee, Derek and Alex braved a month’s rainfall in a couple of hours to attend the North West Casual Classics annual bash at the Hale Carnival. 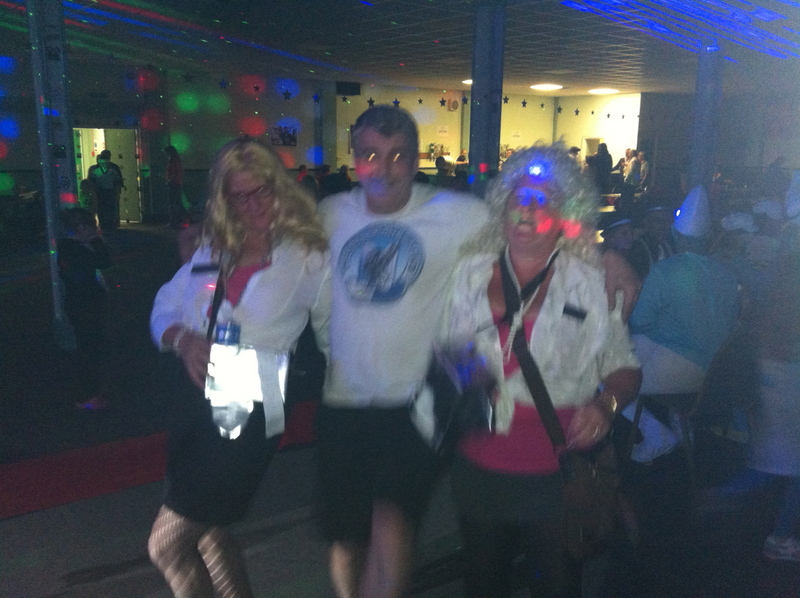 Richard and Dave S. boosted morale by attending. Thanks, Chaps! 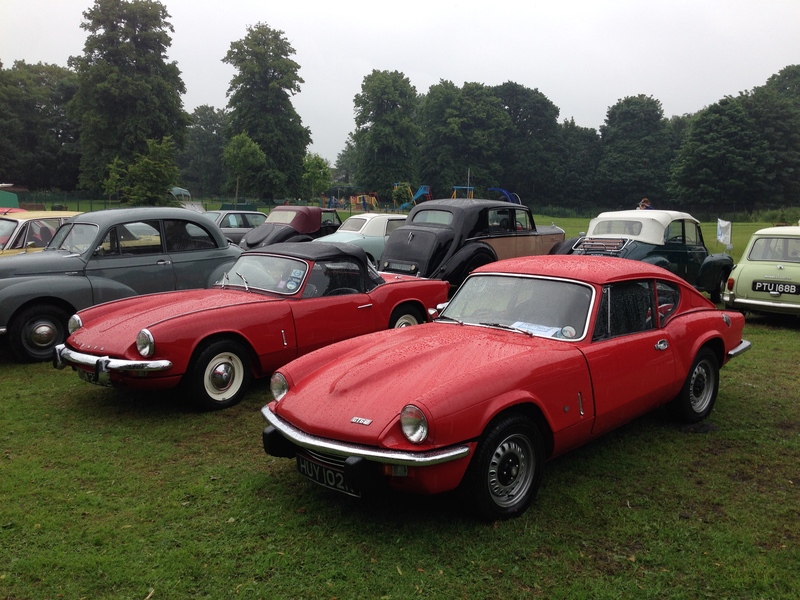 Just a few of the Triumps on show at Swettenham. 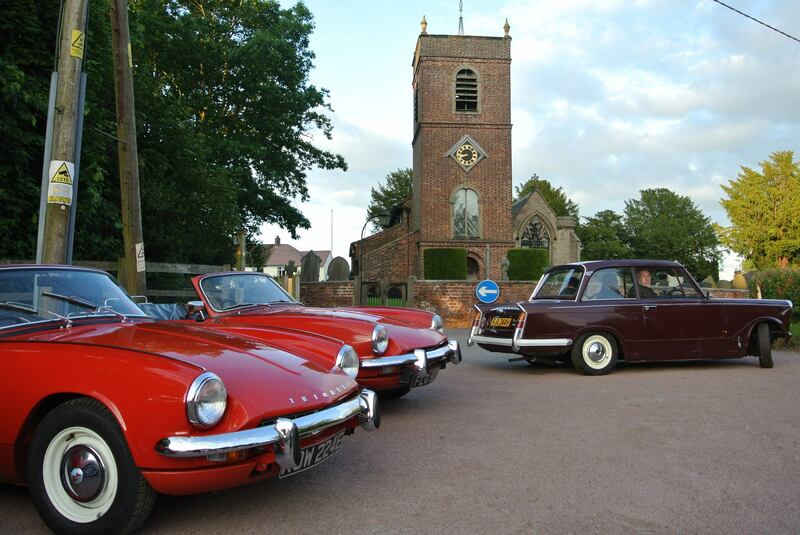 St. Peter’s Church provided the backdrop for our cars. Another great run-out to Swettenham, looks like this is becoming a yearly event? 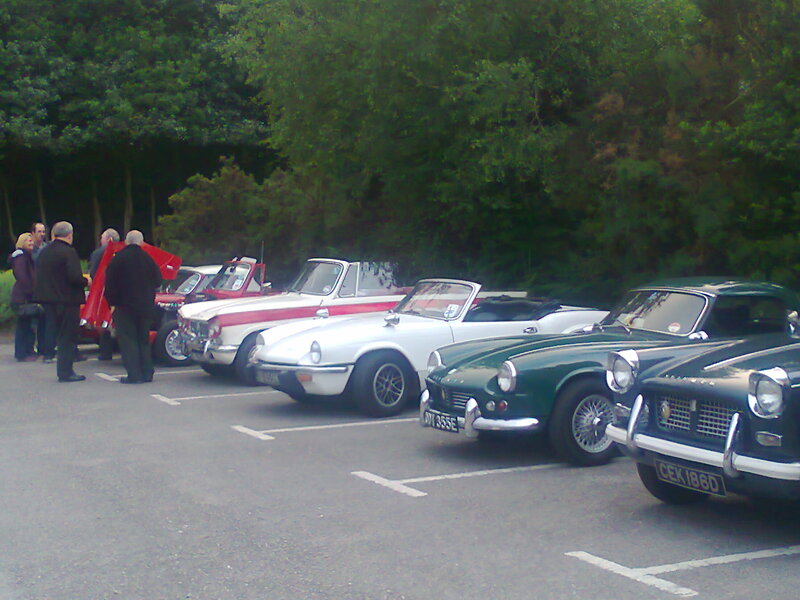 A thoroughly enjoyable night, with plenty of Triumphs in the Derby Arms car park. The 3+ hours flew by with conversations aplenty. Next year, it’s off to Wirral. 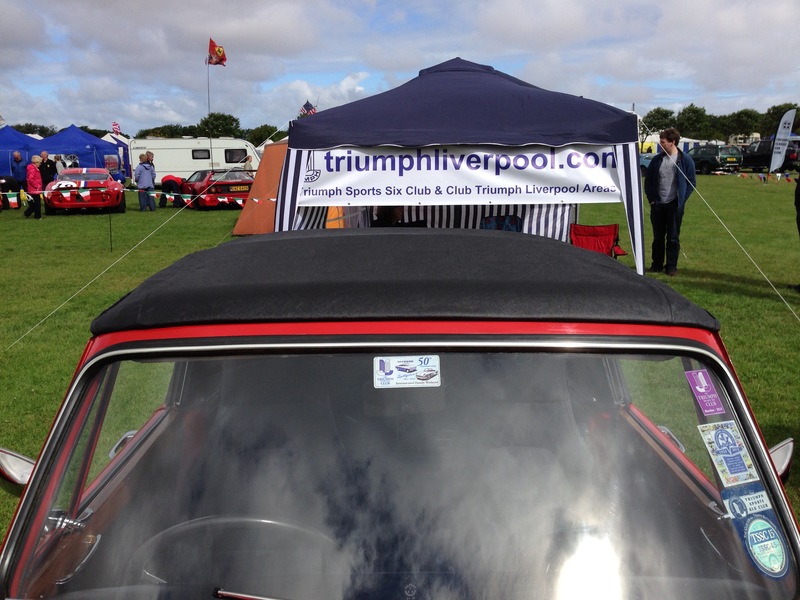 Another fantastic Motorfest again this year, with triumphliverpool members once more out in force. Lol arrives early Saturday morning. 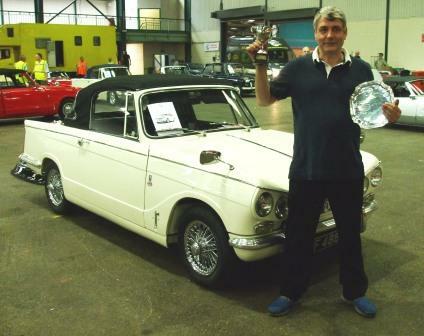 Much fun, polishing and debauchery was had at this year’s flagship TSSC event at Stafford, with Lol picking up the Best Vitesse award, and Alex 3rd in Best Spitfire…. A fine day was had at Speke Hall – unfortunately not all of us made the show due to last minute hiccups, but the day was a great success and we were blessed with the remnants of the recent heatwave! 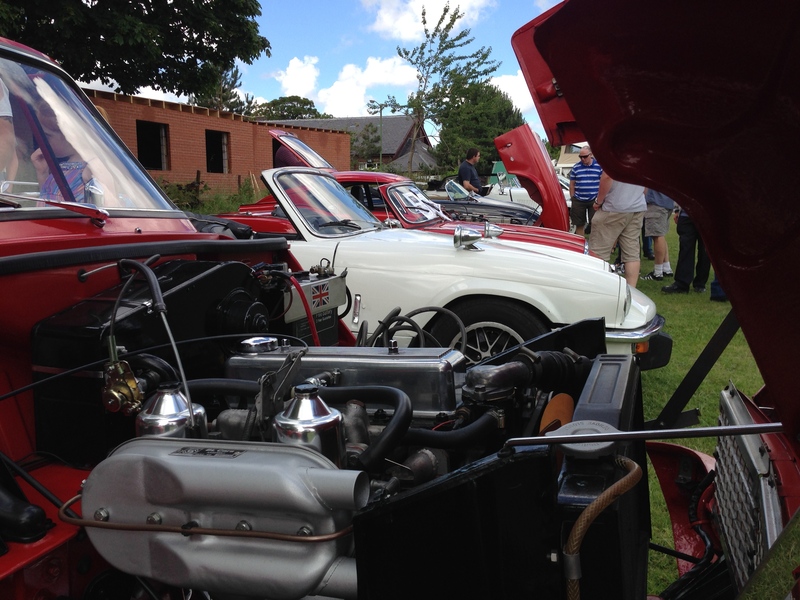 The Lydiate Classic Car & Bike Show was a quite brilliant event, with many vehicles from the West Lancs/Mersey region filling the considerably sized Parish Hall field. 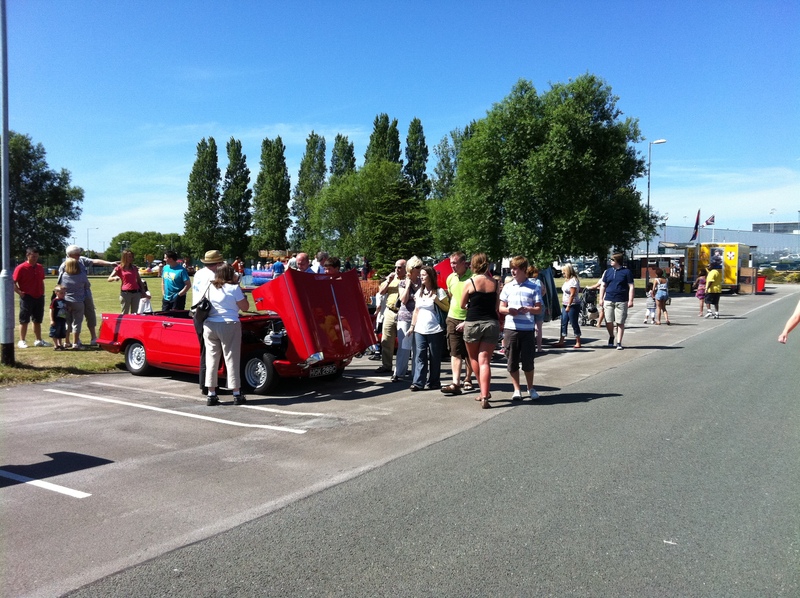 With brilliant sunshine, a good local attendance, and plenty of good-old fashioned refreshments, we had a great time. Roll on next year! 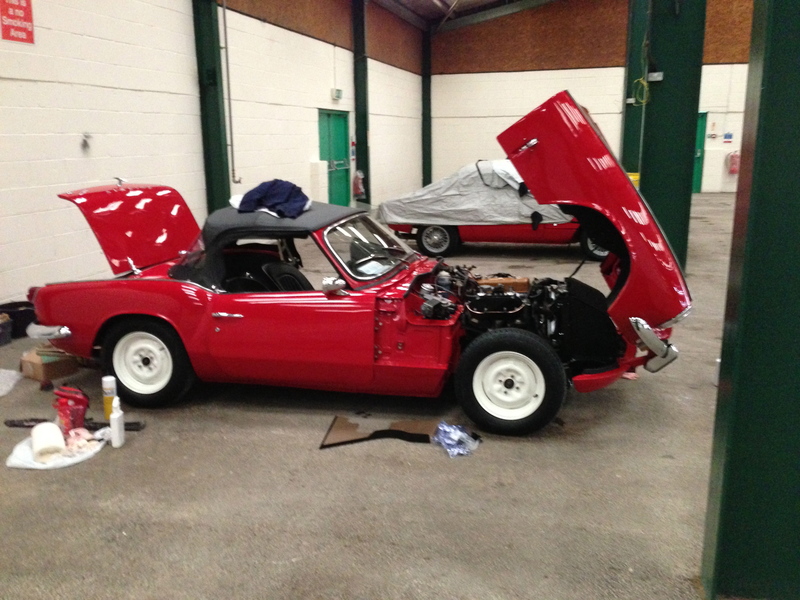 Lol’s Vitesse spent the day with the hood and bonnet up. 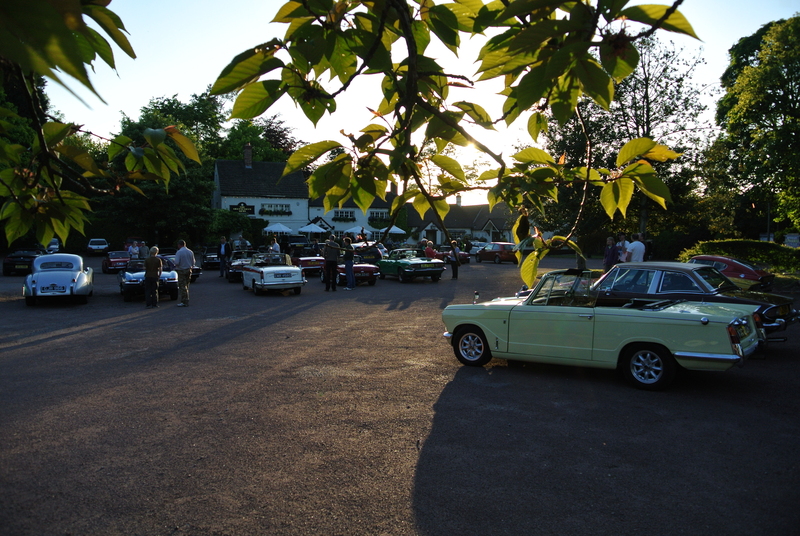 Cheshire TSSC hosted the Annual North West Meet-Up at the delightful Swettenham Arms in erm…. Swettenham. 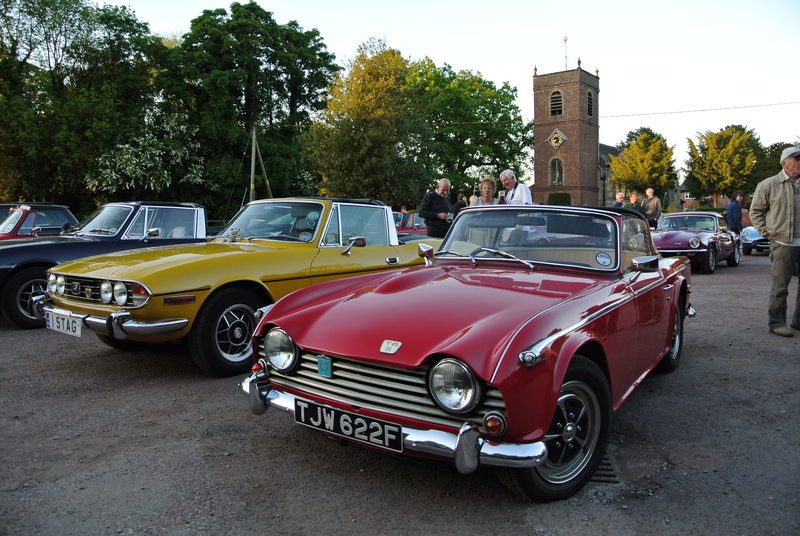 triumphliverpool members joined Cheshire, North Wales, Wirral and even Shropshire Areas on a warm, sunny summer’s night at the Austen-esque village pub for a few drinks and a lot of chat. 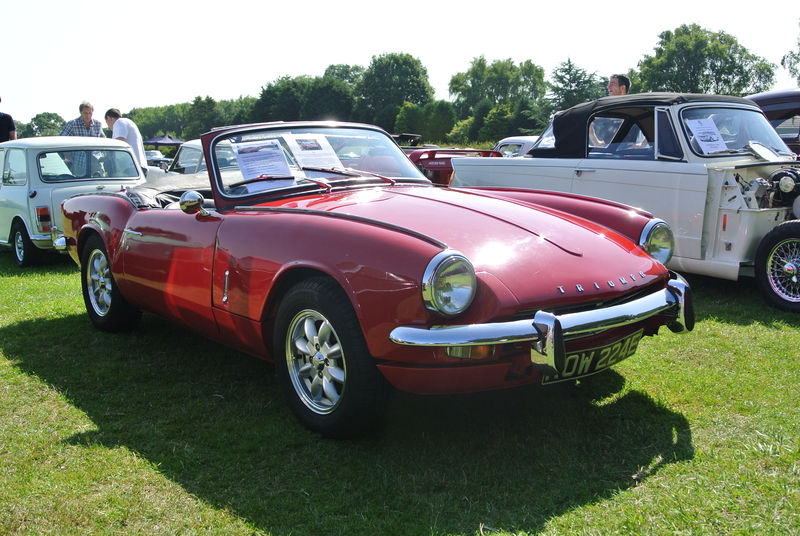 There were quite a few non-Triumphs in attendance, the superb Jaguars taking alot of attention. A couple of exceptional Jaaaaaaaaaaaaaagsss! It’s our turn next year, we’ll do well to top the last 3 years meetings! 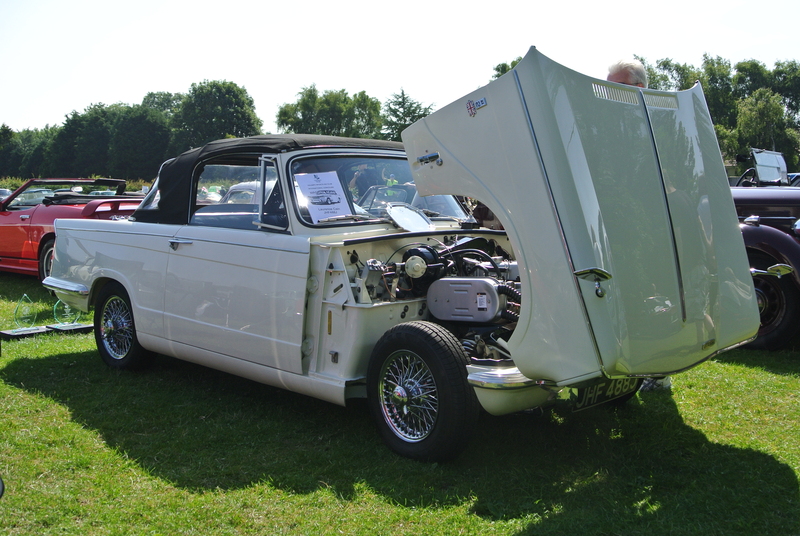 triumphliverpool members attended the STAR 90 Rally at the Heritage Motor Centre, Gaydon., the largest collection of Triumphs assembled for many years. Hettie the Herald draws admiring glances. 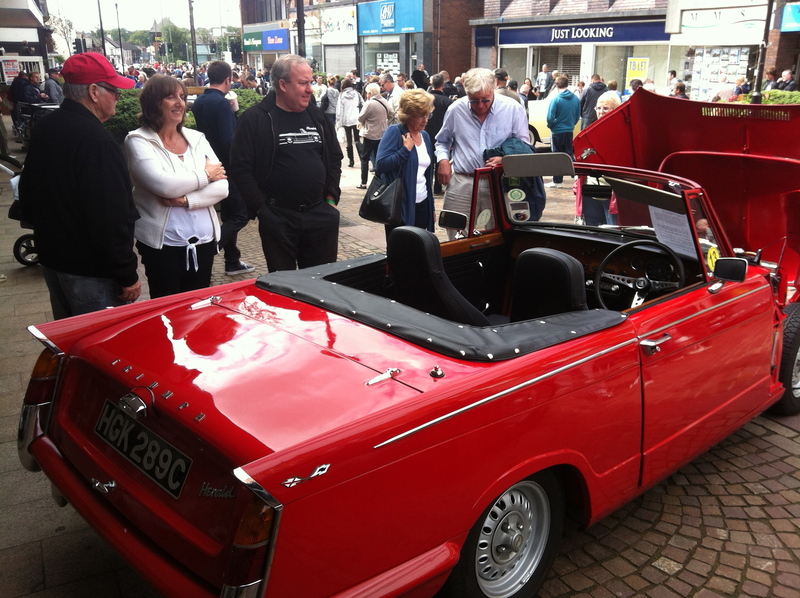 Large crowds flocked to Ormskirk town centre for the 2nd Ormkirk Motorfest. Some shocking Bank Holiday weekend weather thankfully lifted, to be replaced by blue skies and sunshine, as Steve and Cath braved the crowds and bemused shoppers. Lee, his Dad and Alex were parked in Coronation Park in more typical car show surroundings. 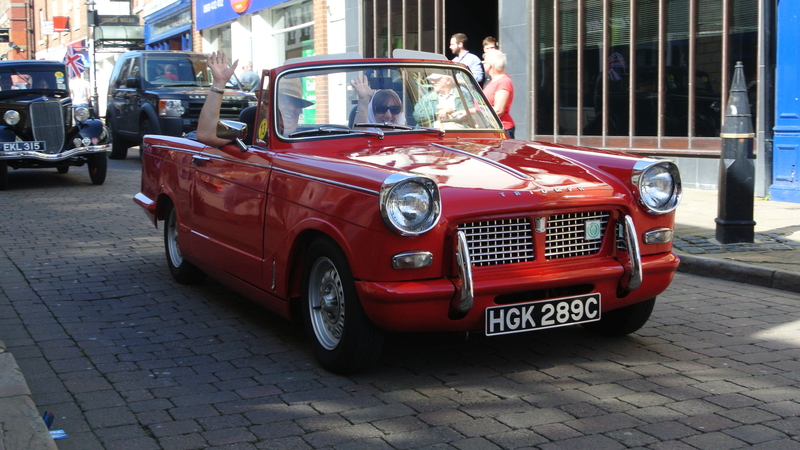 Steve and Cath later took part in the parade around the town, the crowds loving the retro rides as they burbled and roared along, some residents bringing couches out to bask in the sunshine as the cars sped past! Lol wins the Masters, Alex Runner-Up in Best Spitfire Class. 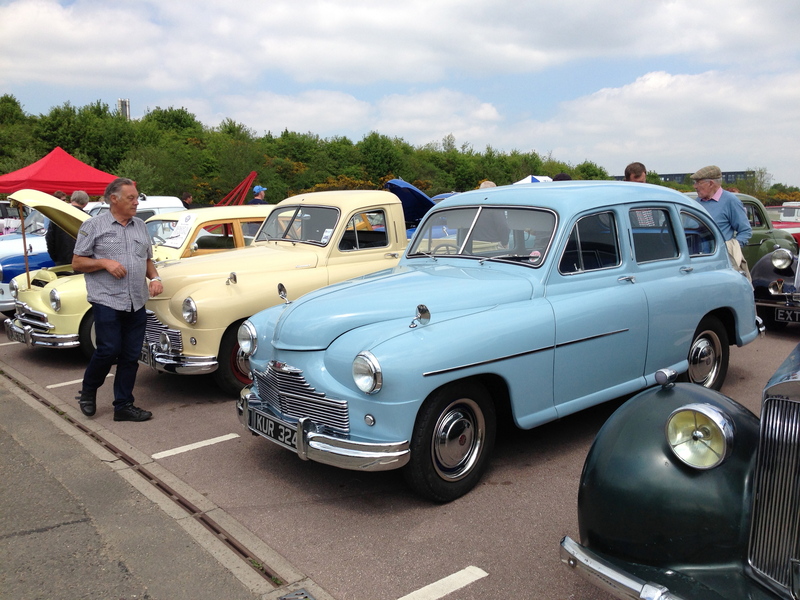 Well – what a wonderful time was had at Stafford this year – culminating in a double success in the Concours. Lol took the honours as he picked up the Masters Class title, with Alex taking the Runner-Up position in the Best Spitfire Class. Lol collects his shield and trophy. 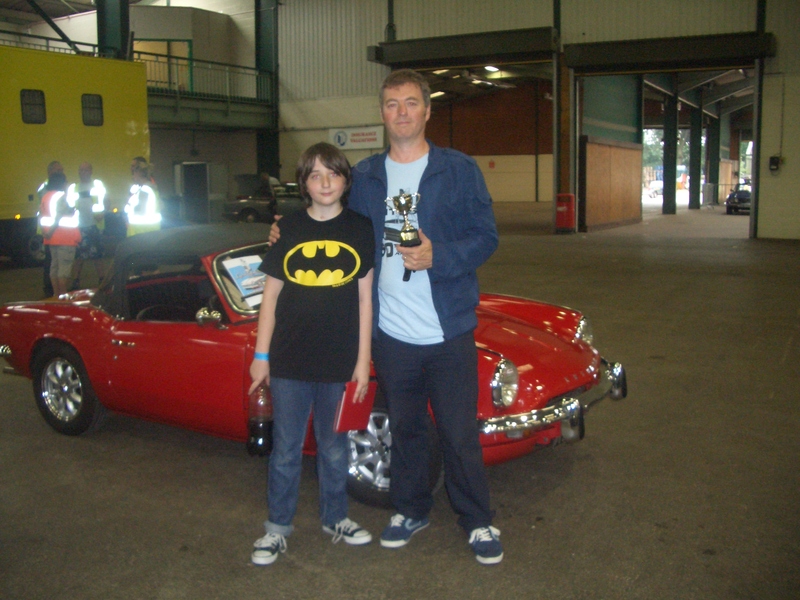 Alex collects his trophy from Bill Sunderland. Lol with his Vitesse after winning the Masters! Alex with his proud polisher Joseph. The Saturday night provided an opportunity for Lol to put all his Concours prep behind him as he took to the dance floor! 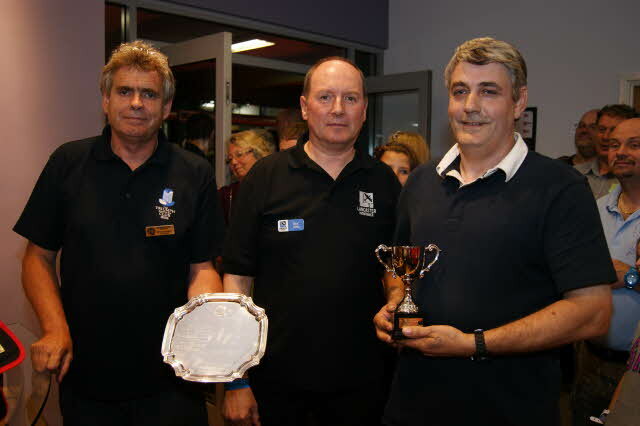 Robin Stead (MkIV Spitfire-3rd place), Chris Tickner (Mk3 Spitfire-Winner & Car of Show), Alex Cain (Mk3 Spitfire-Runner Up). What a fantastic drive out we had to the stunning Ruthin Castle to meet with our chums from North Wales, Wirral, and Cheshire. We were certainly lucky with the weather, the drive down into Ruthin was breathtaking. 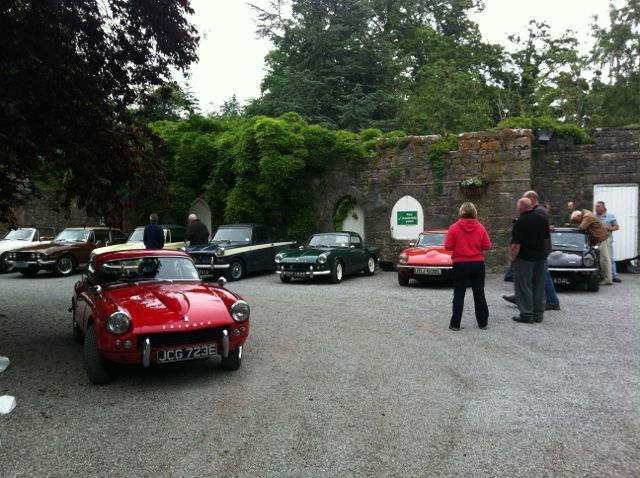 Some of us had a bite to eat in the Castle Hotel, which itself attracted almost as much attention as the 30 or so Triumphs and couple of MGB’s. Next year it’s the turn of Cheshire to host the meet-up. Four on the “Cast Iron Shore”! Mustering 4 cars, we forced our way through the throngs who had witnessed the end of the Liverpool Sea Odyssey, as the Giants slipped away into the Mersey. The Marina was full to the brim, so we fought our way to Otterspool Prom, where a quick pint (of Juice of course), was on hand. Moving on to Aigburth, we soon realised that every pub in the vicinity was full of sightseers. 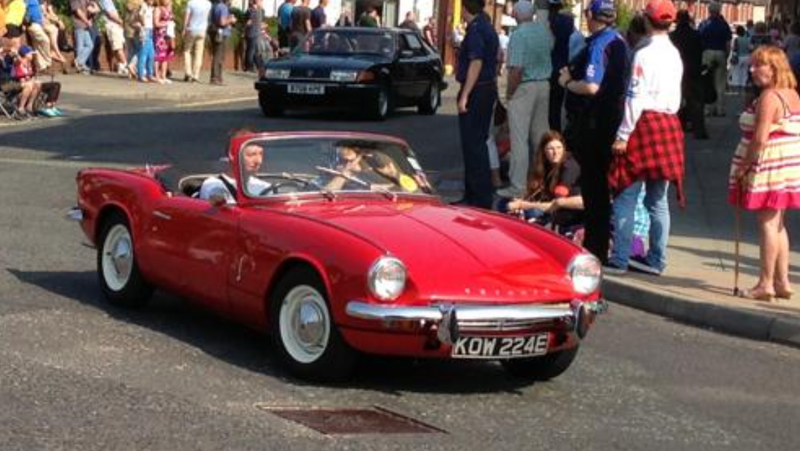 At least a fair few people saw our cars, which I suppose is what the day is all about? There’s always next year, Giants permitting! 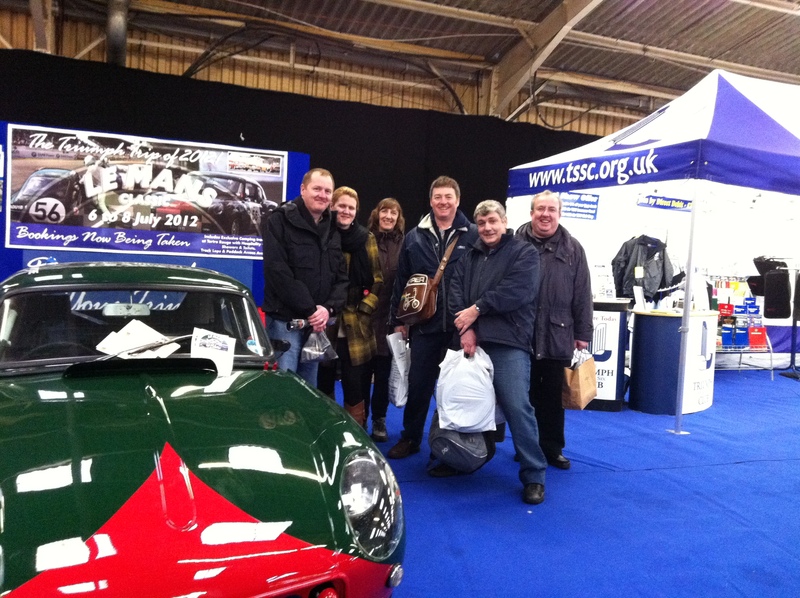 Those of our group who could be mustered *pose* by the TSSC stand at Stoneleigh. Despite the cold, rain and sleet, not to mention the huge spider that fell on my head and the flat tyre on our return trip, we had a great time at Stoneleigh. A few spares were bought, plenty of tea and coffee consumed, not to mention the brass monkeys in attendance. A good night was had at the Yuet Ben Restaurant in Liverpool’s China Town. A tad premature as a Christmas celebration perhaps, but a good night nevertheless! Ended up getting kicked out of The Monro in Duke Street, so it must have been good! Some of our group admire the rarities at Mouldsworth. Our small convoy gleams in the autumnal sunshine outside the museum. We had a great drive through the Cheshire lanes and an excellent lunch at the Goshawk in Mouldsworth. 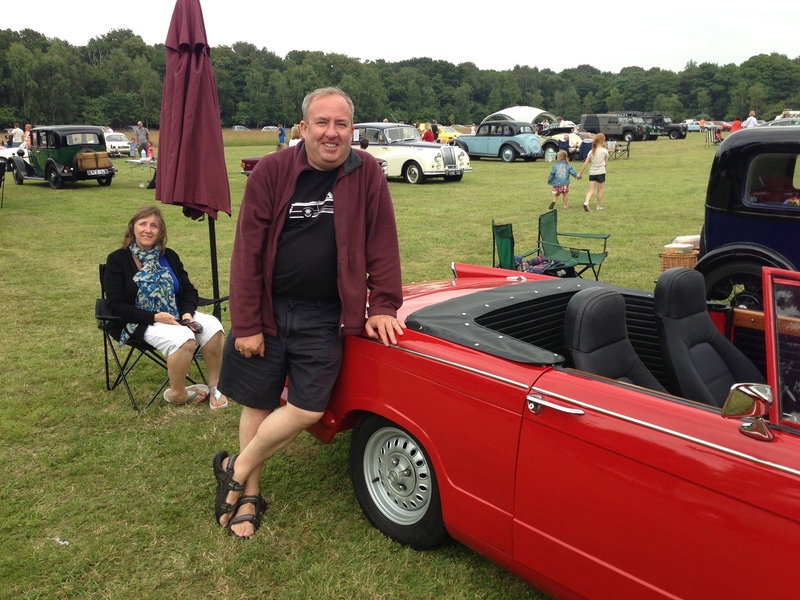 We even allowed former Herald 13/60 pilot Dave Marrin to follow behind in his rather lovely new Volvo Amazon. 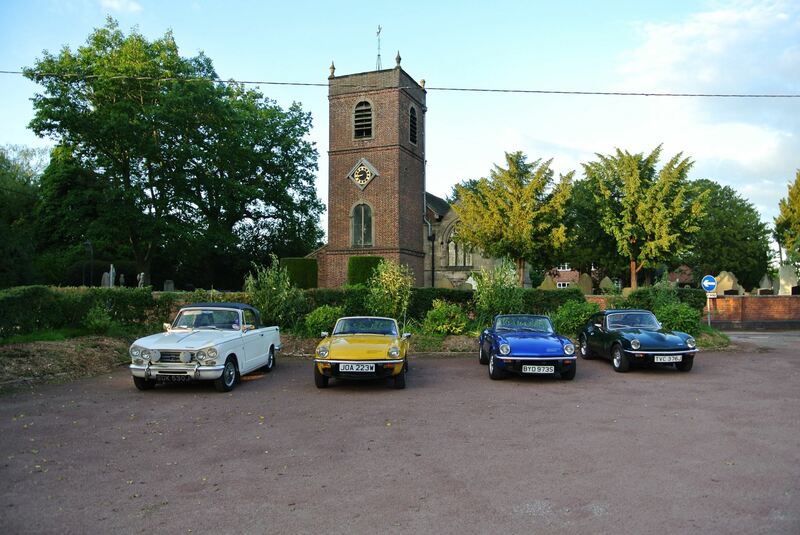 We welcome enthusiasts of all Triumph Clubs and none at our gatherings. 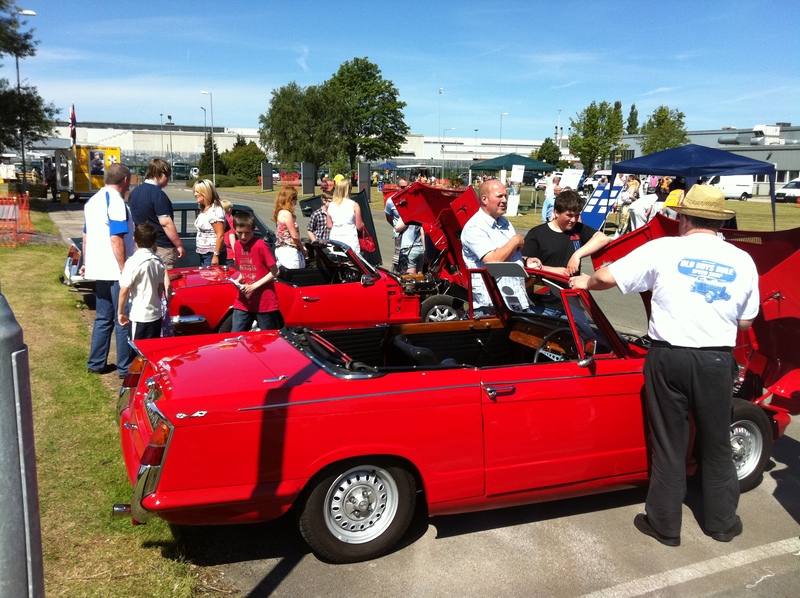 Lol asked some of us to come and help him out with mounting a display of classic cars at the Gertrag-Ford transmissions plant in Halewood on their family open day. Four of us brought our cars along, and they attracted a lot of attention all day. Particularly interested were the young German engineers from Gertrag who went over our classics with considerable interest. A great day, and thanks to Lol for setting it up. Triumphs at the former Ford Transmission Plant! 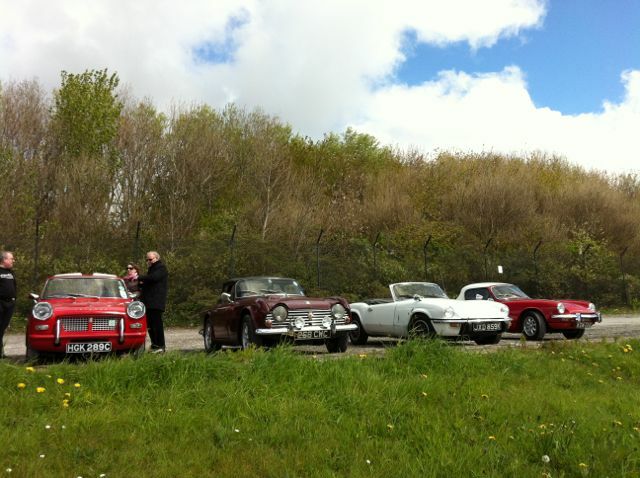 A fantastic day was had at the Bodelwyddan Castle event, tagging on to the North Wales TSSC & MG Club, we had a great drive along the A55 coast road via the Runcorn Bridge, a great experience in a Classic convoy! 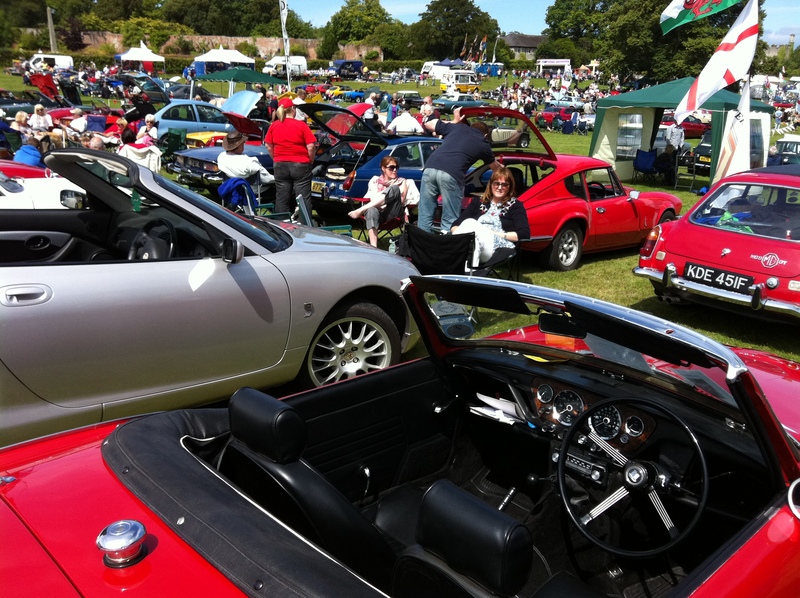 Lee’s GT6 drew a lot of admirers at Bodelwyddan Castle. 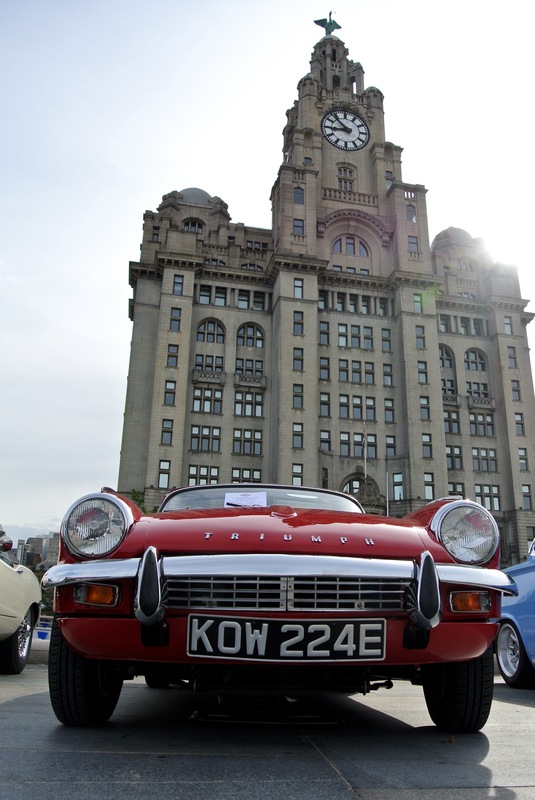 All Liverpool Area cars in this picture, apart from the gorgeous green Spitfire 4 Mk2. It was our turn to visit the neighbours in June, linking up with our friends from North Wales and the Wirral at the Wirral Area’s regular haunt. 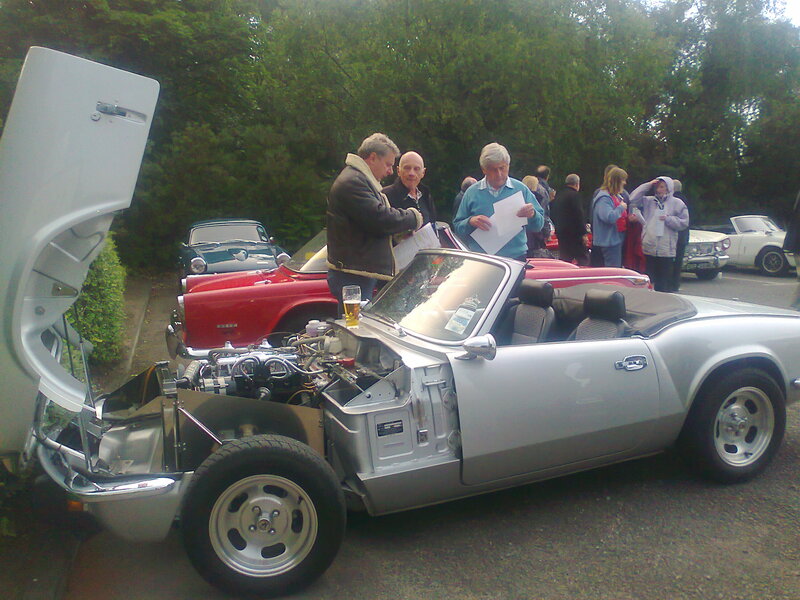 A great evening was had by all, as we ignored the sporadic rain and talked Triumphs. 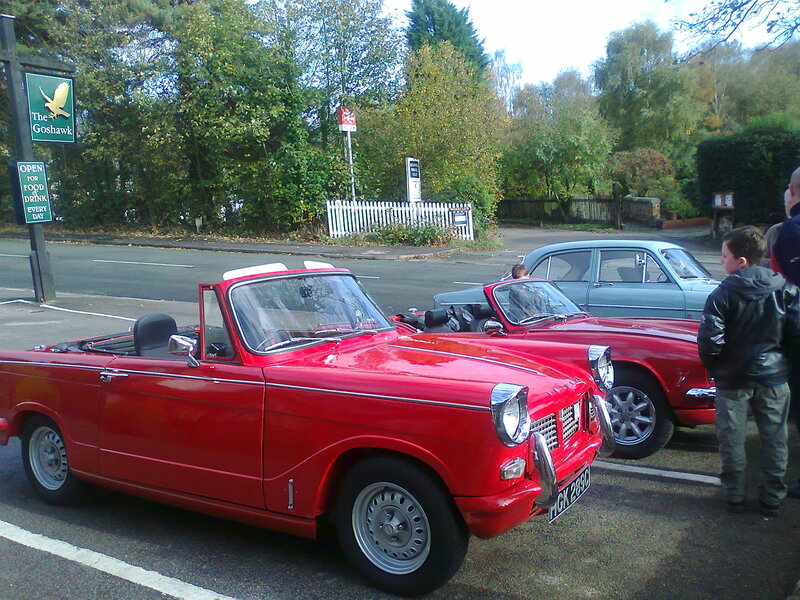 We don’t think we have seen this many Triumphs in a pub car park since the 70s! Lots of clever fabrication and some subtle parts-swapping and blending in evidence on Derrick’s immaculately-presented late-model Spitfire. The pint was only available to special order!